So I totally wanted to do this post in October. Remember October? Freakishly warm weather, lots of sun, happy days. But then other things keep moving to the top of the to-do-list and now it’s the end of November, which means it would make so much more sense to write about winter boots. Except I’m crap at shopping for winter boots, as I am with most items of clothing that are a necessity (you should see the inside of my underwear drawer. Better yet, you shouldn’t.) I don’t like looking for shoes that are practical in the cold, because I don’t like the cold, so by the time I’m ready to concede defeat to winter and run to the shops, everything’s either sold out or too heinous to consider. So, please, if you have an tips on where to find a good pair of winter boots, tell me. 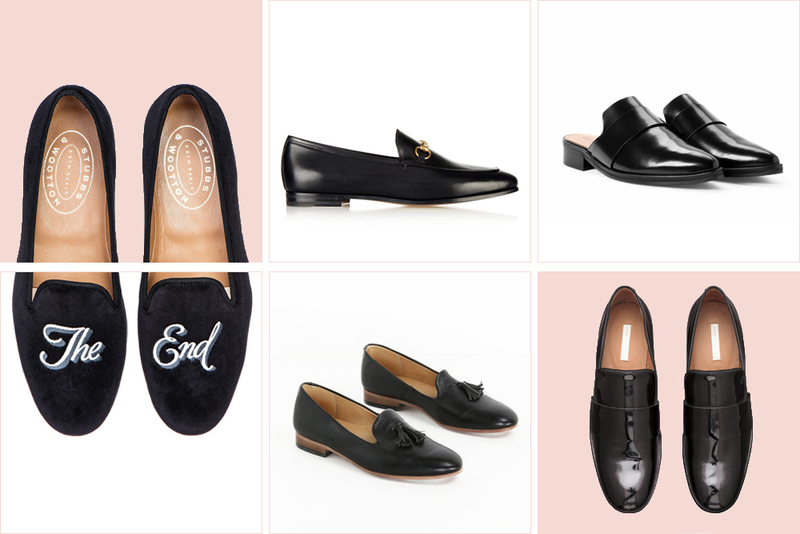 In the meantime, here are some amazing loafers, and a few reasons why I decided to write about them now. 1/ Ever since I got the New & Lingwood for Alex Eagle velvet loafers (above) at the beginning of summer, I’ve been practically unable to take them of. Wearing them makes me feel like a lord of the manor and even though loafers, in general, are the most comfortable shoes imaginable, they give a certain regalness to an outfit, especially if the outfit is something relaxed like rolled-up boyfriend jeans and a tee. And I like anything that makes me feel dressed up without making an effort. 2/ The ubiquity of fur-lined Gucci slippers in all of the street style photos from the most recent fashion weeks. You know the ones I mean. They were everywhere. And the more I spotted them, the more I was convinced that preppy loafers are the way to go (ah, the trickle-down effect of fashion). They also gave me the idea for how to wear them to keep warm: with socks. Socks that you’ll want to show. & Other Stories have a ton of great cashmere socks in different colours at the moment, as well as sparkly ones that I will pair with my loafers on a night out. My contribution to looking festive without putting on a Christmas jumper. 3/ Unseasonable shopping is… the new black? Ever since designers began putting out six collections a year, the schedule for when to buy what has been completely out of whack. The winter sales start in the fall, summer dresses hit shops in February and good luck trying to find a bikini when you really need one, i.e. in June. Which is crazy and frustrating, but at least gives me a good reason to justify otherwise idiotic seeming purchases. Like loafers in November. Ha! Also, spring will come around again eventually. Until then, I’ll look at them as a promise. This entry was posted in fashion, hers and tagged Dieppa Restrepo, Gucci, H&M, loafers, Mango, Stubbs & Wootton. Bookmark the permalink. Post a comment or leave a trackback Trackback URL.